Today Backstage Theatre Tours launches Backstage Theatre Doodles, a funky hand-doodled range of men’s and women’s T-shirts made from 100% organic cotton. To celebrate we’ve had a look at potential Christmas presents for any theatre loving friends and relatives. Theatre tickets make a great gift of course, but they’re not always the easiest things to buy. You have to check people are available, be sure they want to see the show and get their seating preference right – not at all easy if they’re a theatre fan! Theatre tokens are a good option, and can be used at over 240 venues including the West End with no expiry date but what about if you want to get something more personal? If you’re buying for a musicals fan you need to get yourself to the Stage Faves website. It’s a database pulling together the public social media feeds of over 2000 musical theatre performers. There’s some very smart merchandise on sale too, including an exclusive “All I Want For Christmas” range (pictured above). If you know your loved-one’s favourite musical performer, you can order a personalised t-shirt, bag or hoodie for them to show their support! To go with it, mine the Stage Faves database for social media and website info and have a look at which musical theatre stars have an album on sale. Musical theatre goddess Kerry Ellis rocks some great music including exciting collaborations with Brian May. Latest album KE is a contemporary take on several well-know songs from musicals on stage and screen. Or try West End and Broadway star Ramin Karimloo‘s beautiful and unique amalgamation of bluegrass and musical theatre: The Road to Find Out – “East” . Basically there are two types of Shakespeare fan: those who love cats in ruffs and those who hate them. For the first kind you’re in luck as there are all kinds of kitsch Shakespeare themed trinkets you can get hold of. Hit the Shakespeare Birthplace Trust for everything from Shakespeare Duck Lip Balm a Shakespeare-style retelling of Star Wars or stay feline with a Five Cats of Shakespeare mug from Catapostrophe . For the more serious Shakespeare fan you’ll have to think a bit harder. 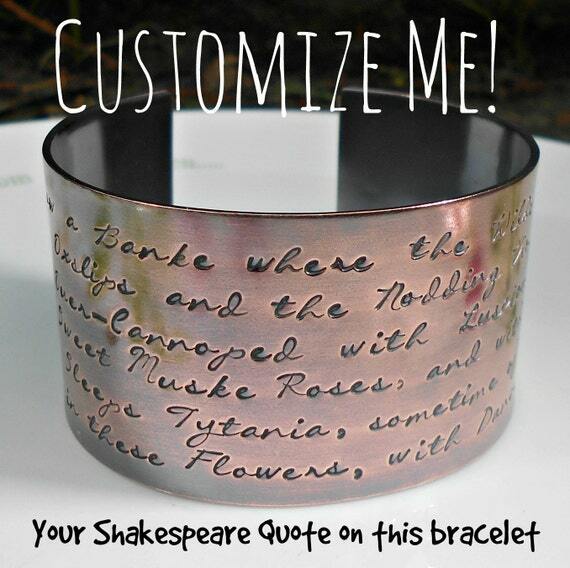 You can get handmade copper bracelets customised with a hand-stamped favourite Shakespeare quote from Wicked Wordsmith (pictured above) . Or how about a beautiful hardback facsimile of a Shakespeare’s play as it would have appeared in the First Folio, available from Shakespeare’s Globe shop. The Duke of Edinburgh was even presented with one during a visit several years ago so you can’t get fancier than that. Do you know someone with an insatiable curiosity who is always wanting to snoop behind the scenes? Make their dreams come true by booking them a backstage tour. The National Theatre runs a great range of backstage, costume and architecture tours and you can even book a delicious afternoon tea and backstage tour package. And a must-have for the Christmas stocking is the book Curtain Call: A Year Backstage In London Theatre, a gorgeous collection of behind-the-scenes photos and interviews (pictured above). Theatre and books go together so well. For the reader with stamina, Daniel Rosenthal’s The National Theatre Story is a doorstep of a book that will keep them quiet through the festive period. Pekka Salminen’s glorious photographic hardback Theatres is an exploration theatre spaces from ancient amphiteatres to innovative modern spaces. Or Ian Kelly’s Mr Foote’s Other Leg: Comedy, Tragedy and Murder in Georgian London is the true tale of Samuel Foote, a 18th century dramatist, actor and comedian whose story was recently brought to the stage with Simon Russell Beale in the title role. For an interesting selection of playtexts, visit the Royal Court Theatre where the staff will definitely be able to recommend something fresh and exciting. Besides a quirky Backstage Theatre Doodle’s T-Shirt for your artistic friend, have a look in Benjamin Pollock’s Toy Shop. They stock a range of toy theatres from cute little matchbox sized ones to the most exquisite detailed replicas in wooden boxes. This adorable La Belle et La Bête Theatre requires some scoring, folding and cutting with a craft knife but is easy to make and so pretty when finished. Just a few suggestions to get you started with theatre-themed Christmas shopping…please add any other ideas! And remember that no festive shopping trip is complete without a mince pie, mulled wine, hot chocolate or all three.